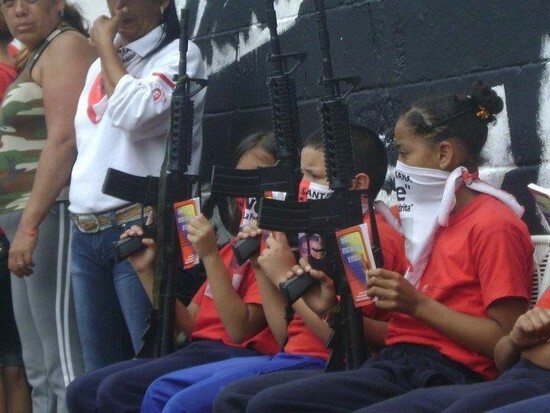 February 4, 2012 /Photography News/ Seated beneath a mural of Jesus Christ holding a gun, children aged 3 to 7, covering their faces with political bandanas display assault rifles as adults proudly stand beside them. These pictures were posted on Facebook and Twitter by a radical political group based in a working class neighbourhood of the Venezuelan capital. The group in question, the La Piedrita Collective, controls the 23 de Enero parish in Caracas, a neighbourhood that has been a leftwing stronghold for decades and is where Venezuela President Hugo Chávez - whom the collective claims to support - casts his vote during elections. Hugo Chávez, who has a reputation for courting controversy, drew the line this week and condemned the widely circulated photos, calling the members of La Piedrita irresponsible. In a country where homicide rates have drawn comparison to war zones, the photos have sparked heated debate over Venezuela's fractured politics and the role of the self-proclaimed "revolutionary" government in encouraging an armed civilian defense force, which officials have said total as many as 150,000 strong. The photos were also a start-off point for a march organized by the same collective, La Piedrita, through which they demanded respect for the children in the photographs. Thanks dear for this post. astrology consultancy in india.